W.Bro. Surendranath Villupuram Amarnath was born in Chennai on the 21st November 1969 to Mr.V. S. Amarnath, Mrs. Sarojini Amarnath as their eldest son. Mr. Amarnath was employed with Reserve Bank of India, Chennai. Bro. Suri, as he was known to his friends, earned his Master’s Degree in Computer Applications (MCA) in 1993 from the College of Engineering, Trivandrum. An Information Technology specialist, Suri spent over 14 yearsin Chicago, delivering IT solutions for Fortune 500 companies.In 2008, he co-founded Thoughtline Technologies, an IT company based in Technopark, with operations in India, USA and Europe. For detailed Masonic Biodata, click here. Bro. Dr. Madhav Manoj J.W. W. Bro. 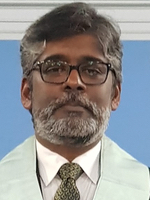 Dr. Manoj C. Balagopal Dir. of Cer. Bro. Dr. Kishore Somanathan S.D. Bro. Dr. Madhu Kandekath B.V.S.L. Bro. Dr. R. Achuthan Nair I.G.